Skies are absolutely crucial in landscape painting, where they have the power to determine the whole atmosphere of the scene. Constable made an almost scientific visual study of changing cloud formations, which he subsequently used to effect in paintings filled with light and drama. Turner, more impressionistically, captured rapidly the evanescent quality of British skies and used these studies as the very inspiration for his paintings. However, in the effort to render the more concrete elements of a landscape, students often neglect skies, or fail to make them an integral, and thereby credible, part of their compositions. To accompany his book, published by Studio Vista, popular artist and teacher Ron Ranson has produced a video simply called Skies, which reinforces their importance and demonstrates a range of techniques to enable the less experienced to tackle a variety of weather conditions. 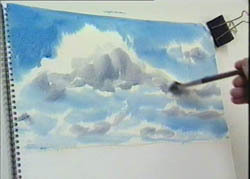 Concentrating on watercolour, which Ranson considers the best medium for the subject, he starts by demonstrating how to achieve the most basic of skies - that which is plain blue. He moves on to discuss a selection of light cloud types including cirrus and a 'mackerel' sky. His demonstrations show his rapid, bold approach along with useful observations such as noting that clouds will get smaller towards the horizon due to the effects of perspective. He shows how to create smaller clouds by lifting paint away with tissues and later, when tackling the heavier cumulo-nimbus variety, he uses a similar technique through a triangular mask, to make yachts magically appear! The classic 'cotton wool', cumulus cloud is explored in the fifth demonstration, showing how an understanding of the light is important to create their bulky form. Finally, before moving outside, he shows how to use a mixture of cloud types in the creation of a boldly-coloured sunset. 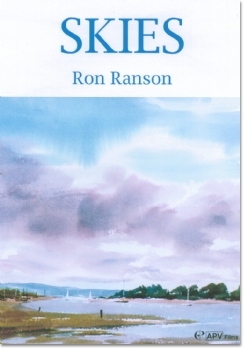 Out on his balcony, Ranson brings us to the difficulties of tackling a fast moving sky. Photographs can often be of assistance in such cases, or if the weather conditions are too challenging for a study to be made. After completing a painting of his view of fields and an estuary, he works back in the studio from one of his more dramatic photographs to create a strong, atmospheric painting. Here he demonstrates special effects such as using an eraser to suggest the sun's rays, or splattering white gouache to create snow flakes. Being an advocate of plein air painting, and skies being such an outdoor subject, I was a bit disappointed that so much of the film was shot in the studio, although this did control the conditions to provide an extremely clear teaching aid. 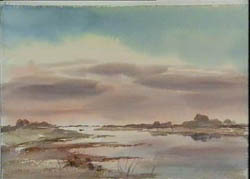 The addition of a landscape horizon line on each painting, although important for the overall appreciation of the demonstrated technique, did become rather repetitive, but this was a very minor point in what was an encouraging and highly informative video. Skies by Ron Ranson uses a mixture of studio examples and outside paintings to illustrate how to capture the mood of a particular sky and consequently create life and impact in a landscape painting. In his fast and loose style, this well-known tutor demonstrates many different types of skies and weather effects, from cumulus clouds to sunsets.